The murder of Gdańsk Mayor Paweł Adamowicz received extensive media attention internationally. The comments on the tragedy have been focusing on possible political motivations behind the attack. 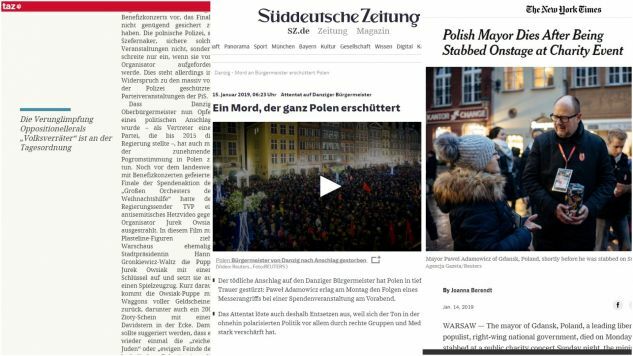 Apart from reporting the facts of the case, some newspapers have chosen to publish comments on the crime in relation to the political situation in Poland. Most of the comments link the tragedy to the tense political situation in the country. But do the facts of the case support such assumptions? The New York Times in its extensive coverage chose to focus on the differences between the murdered Mayor and the current conservative government, accentuating Mr Adamowicz’s stance in favour of LGBT rights and welcoming refugees into the country. It reports the clear response to the attack by the government but goes on to cite examples of hostile right wing rhetoric against liberal opposition, failing to specify that the incidents cited were not the work of the ruling party but of far right groups. World media covered the murder of Paweł Adamowicz, with some portraying it as politically motivated attack. They paint a political scene full of aggression which they feel has been caused by the ruling political right. “Frankfurter Allgemeine Zeitung” states that the mayor was “for years an object of hate for the Polish right” and adds that the right also hated the charity which staged the event at which Mr Adamowicz was killed. “Tageszeitung” goes further still, citing a “climate reminiscent of the pogroms” and speculates that the Polish government may attempt to use the tragedy in Gdańsk to prosecute Mr Jerzy Owsiak, the head of the charity that staged the event in order to “lock him up”. The act was committed by an individual who has never been involved in politics in any shape or form. The man who committed the offence had just completed a five year prison term for robbery. In prison he was diagnosed with paranoid schizophrenia. He charged onto the stage during the charity concert and after committing his deadly assault seized the microphone to say he was doing this because he had been wrongly imprisoned and allegedly tortured under the Civic Platform’s (PO) rule (the party that was in power when he was convicted) and saw Mr Adamowicz as being its representative. The remarks prove that his grievance with PO was personal rather than political. He resented that he had been put in prison and had been, according to him, mistreated during his incarceration. He did not attack any PO policies or beliefs and did not express any beliefs of his own. His “reasoning” is consistent. 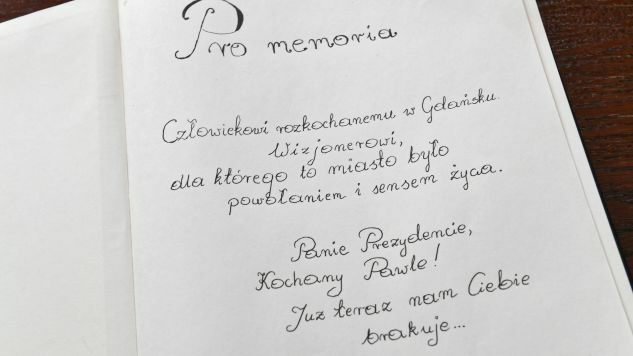 Since being detained for the murder of Mr Adamowicz (an act which was carried out in front of TV cameras and hundreds of participants at the event) the man charged has pleaded innocence to the crime he is charged with. Furthermore, Mr Adamowicz, whom the assailant believed to be a representative of PO, has not been a member of the party since his well publicized decision to stand against Jarosław Wałęsa (son of the legendary Solidarity leader Lech Wałęsa), the official PO candidate for the office of Mayor of Gdańsk, in the 2018 local elections. It looks as if the attacker, who was released from prison a month ago, wasn’t aware that Mr Adamowicz was no longer a member or representative of PO. The charity which organised the concert was legally obliged to guarantee security for the event. The cold facts are that the assailant managed to obtain a press pass and in that way managed to get onto the stage. He then attacked the mayor and went on to walk around the stage with the weapon and speak to the crowd over a microphone. Meanwhile, the security guards stood and watched, and it was left to a technician on stage to initiate the action of disabling the attacker before the police appeared and took charge of the situation. Public investigators have to examine all factors that led up to the murder, including the failures of security. If Mr Owsiak, whose foundation organized the event, is prosecuted, it will not be for his political stances but because of his legal liability as organizer of the event. The assailant himself said nothing about the actual charity during his outburst following the stabbing. There is no evidence whatsoever that he had any gripes with either the charity or Mr Owsiak, and was using the concert as a platform for the tragic and criminal airing of his personal grievance. Since there is no evidence of any other motive apart from a personal one, it is surprising to find that parts of the international media are concentrating on the political angle, an angle that simply does not stand up to scrutiny of the facts.